The prevailing theory when it comes to sequels is, simply, go bigger. 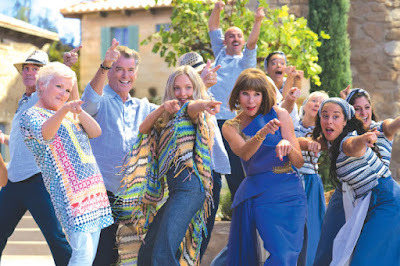 But “Mamma Mia!” (2008), the ABBA jukebox musical, was plenty big, in aesthetic, box office, and star power (see: Dame Meryl Streep). 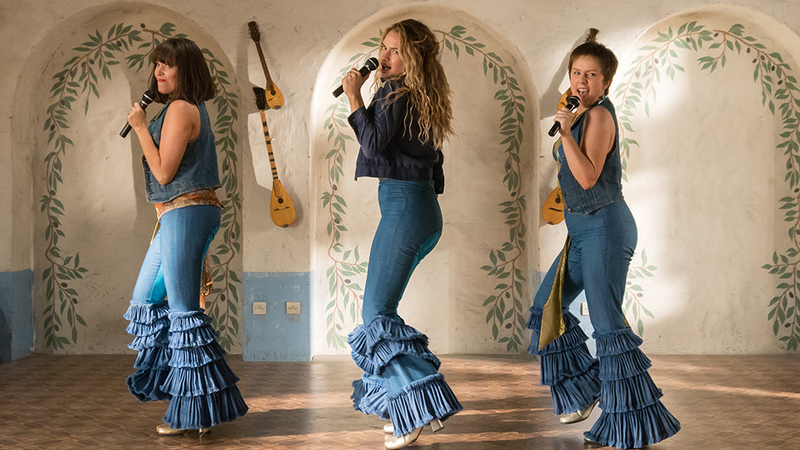 So, for the just-released follow-up, “Mamma Mia: Here We Go Again”, writer/director Ol Miller makes a lateral move, forgoing bigger for lighter and frothier. The original was not particularly plot heavy, but it nevertheless posed a central question – namely, whether Bill (Stellan Skarsgård), Harry (Colin Firth), or Sam (Pierce Brosnan) was father to Sophie (Amanda Seyfried), daughter of Donna (Meryl Streep). A soap opera, perhaps, but a story point just the same. And though “Here We Go Again” is nominally tied to whether Sophie will get her mom’s Grecian hotel the Bella Donna ready in time for its grand re-launch, the bigger questions are more along the lines of, say, when and where will Cher appear? (It’s like waiting for Lady Gaga instead of Harry Lime.) And how blue is the Aegean Sea? Answer: so blue. That sparkling blue water is “Here We Go Again’s” aura color. The one way in which “Here We Go Again” does amplify is its dueling storylines. In the present, with Donna having passed away, and who is represented by a sort of Dia de los Muertos portrait as Glamour Shot, Sophie works in concert with her hotel manager (Andy Garcia) to get the Bella Donna ready to go while simultaneously worrying that two of her three dads – Bill and Harry – might not make the ceremonial christening. 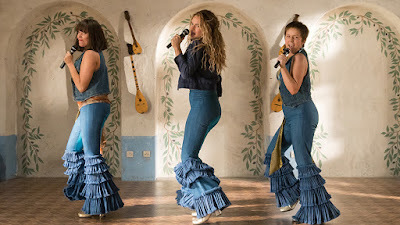 In the past, events mentioned in the original are brought to life as the college graduate version of Donna, played by Lily James, treks from Oxford to Greece and encounters the younger versions of Bill, Harry, and Sam. And though the movie’s conclusion sort of literalizes the spiritual connection between mother and daughter despite now being eternally apart, the narrative toggling between then and now evinces the same sensation, as if mother and daughter are speaking to one another across space and time. Music has always possessed that same sort of immutability, and so the sense of cosmic communication is organically furthered by the movie’s soundtrack. Granted, because the series’ foremost tenet requires all that music to be ABBA’s, Miller is mostly compelled to mine the Swedish band’s back catalogue since many of their most popular tunes were already deployed in the original. If that might well be an issue for viewers who are disappointed when they don’t find a band’s Greatest Hits on the jukebox, it is a blessing for any (raises hand) who thrive on deep cuts. And if I, faithful reviewer, might be a tad disappointed that “Here We Go Again” failed to work in that astonishing insistent synth bass in “What About Livingstone?”, well, hey, the movie’s first number, “When I Kissed the Teacher”, is no less gleefully kitschy. Sung at young Donna’s graduation it becomes both her post-graduate declaration of adventure and the movie’s edict to sail away on its sonic summer breeze. Not that “Here We Go Again” completely foregoes hits. “Fernando”, which was left out of the original movie, appears, and while its showbiz choreography might be limited the sequence’s inherent theatricality still pushes right through the camp ceiling to access starry sentiment. The immortal “Dancing Queen”, meanwhile, does earn a reprise, and the at-sea sequence it adorns – suggesting the Kylie Minogue line “We’re in a place where heaven breathes” which is culled from a song called “Love Boat”, which, suffice to say, is not an accidental reference here – stops the movie in its tracks to just kick back and celebrate. That celebratory air evokes the entire movie, even when the tone is ostensibly melancholy. Sullen characters sail straight into the heart of heart-stopping sunsets; fishermen lamenting their economic downturn have a drink and cut loose; even the storm that briefly halts the Bella Donna’s progress barely registers as anything more than a passing shower. All the actors, bless their heart, are tuned into this festive frequency, whether it’s Garcia fashioning gravelly-ness as pure uncut charisma or Jessica Keenan Wynn playing the part of Young Tanya and therefore reveling in the opportunity to live out playing a young Christine Baranski. Wynn is not doing an impression, mind you, just having the time of her life by locking into Baranski’s full-bodied mien. James isn’t really doing a Streep impression either, because how could she, and why would she want to anyway in the face of Streep’s oft-chronicled singularity, even as she embodies Streep’s original spirit, not just in the singing and semi-dancing but, crucially, in her non-singing reacting. Seriously, just watching James watch her fellow performers wrests as much joy as the joy emitted by her fellow performers, whether it’s Keenan Wynn or Panos Mouzourakis as the frontman of a highly questionable local island band. That band’s spirit, which is self evident despite its lack of skill, speaks to the movie’s overriding Put on A Show vibe. That vibe was just as prevalent in the original where, fans might recall, Pierce Brosnan managed some wincing approximation of singing. Perhaps it’s no surprise, then, that he is generally forbidden from singing here, though I found that to be the film’s most significant flaw. After all, if you’re putting on a show then everyone deserves a part.